MARATHON, Florida (CNN) -- Juan Lopez reads meters with one eye and looks for snakes with the other. Lopez is a member of the "Python Patrol," a team of utility workers, wildlife officials, park rangers and police trying to keep Burmese pythons from gaining a foothold in the Florida Keys. Officials say the pythons -- which can grow to 20 feet long and eat large animals whole -- are being ditched by pet owners in the Florida Everglades, threatening the region's endangered species and its ecosystem. "Right now, we have our fingers crossed that they haven't come this far yet, but if they do, we are prepared," Lopez said. The Python Patrol program was started by Alison Higgins, the Nature Conservancy's Florida Keys conservation manager. She describes it as an "early detection, rapid response" program made up of professionals who work outside. 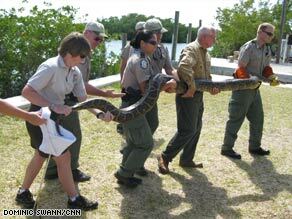 Eight Burmese pythons have been found in the Keys. "If we can keep them from spreading and breeding, then we're that much more ahead of the problem," Higgins said. Utility workers, wildlife officials and police officers recently attended a three-hour class about capturing the enormously large snakes. Lt. Jeffrey L. Fobb of the Miami-Dade Fire Rescue Venom Response Unit taught the participants how to capture pythons. "There's no immutable laws of snake catching. It's what works," Fobb said as he demonstrated catching a snake with hooks, bags, blankets and his hands. "We're doing it in the Florida Keys because we have a lot to protect," Higgins said. "The Burmese pythons that are coming out of the Everglades are eating a lot of our endangered species and other creatures, and we want to make sure they don't breed here." Where the snakes are breeding is just north of the Keys in Everglades National Park. An estimated 30,000 Burmese pythons live in the park. The Everglades, known as the "River of Grass," is a vast area with a climate perfect for these pythons to hide and breed. And breed they do: The largest clutches of eggs found in the Everglades have numbered up to 83. The snakes grow like they're on steroids. With a life span of 30 years, these pythons can weigh as much as 200 pounds. And the larger the snake, the bigger the prey. Biologists have found endangered wood rats, birds, bobcats and other animals in their stomachs. Two 5-foot-long alligators were found in the stomachs of Burmese pythons that were caught and necropsied, officials say. Officials also say Burmese pythons can travel 1.6 miles a day by land, and they can swim to reach areas outside the Everglades. This nonvenomous species was brought into the United States from Southeast Asia. Everglades National Park spokeswoman Linda Friar says biologists believe that well-intended pet owners are to blame for their introduction into the Everglades. "These pets were released by owners that do not understand the threat to the ecosystem," she said. Higgins says 99,000 of the popular pets were brought into the United States from 1996 to 2006, the most recent data available. She says they are an easy species to breed, and you can buy a hatchling for as little as $20. The problem with these pets, Friar says, is that they get too big for their owners to handle. Making the owner aware of what to expect when the animal becomes full-grown is a priority. "The pet trade is pretty supportive in educating people," Friar said. She hopes a "Don't let it loose" message campaign makes an impact on pet owners. Florida Sen. Bill Nelson, a supporter of restoring the Everglades, has introduced a bill that would ban importing the python species into the United States. The senator saw the need after learning about the effect these snakes were having on the park. "Finding out many endangered species are being found in the stomach of the python," Nelson spokeswoman Susie Quinn said, "we need to do a better job at protecting the resources." In the meantime, Lopez and the Python Patrol will continue to protect the Florida Keys by capturing the snakes and turning them over to biologists to perform necropsies. The Nature Conservancy plans to expand the program to all the areas that surround the Everglades, making these predators their prey. "I would like to find them and get rid of them," Lopez said. Members of the Python Patrol show off a giant snake that stretched more than 20 feet.